The Aquatics Centre was the only new venue included within London’s bid for hosting the 2012 Olympic Games. Zaha Hadid had won the design competition in 2004, a year before London was chosen to be the host. In this interview she speaks about the East London site, the design process, materials and ideas behind the space. 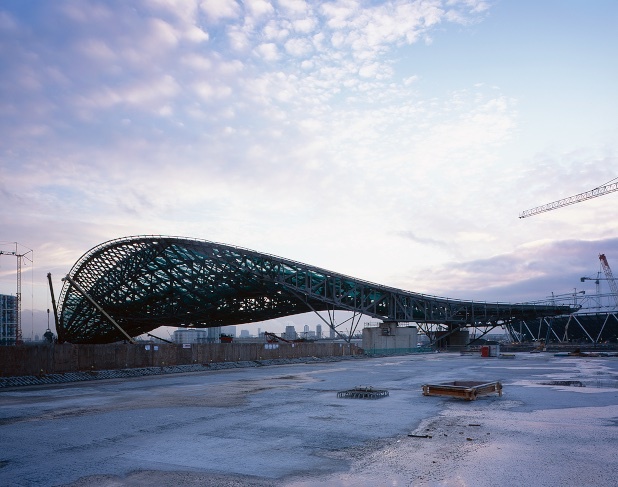 What was more important as a starting point for the Aquatics Centre, designing a public building in East London or an architectural space for the Olympics? It was important to develop a strong design that celebrated all the aquatic sports at the Olympics, but the building must also leave an outstanding legacy as a public facility for everyone in London for many generations after the games. The wave-formed roof design is very appropriate for aquatic sports – combined with the large size and high quality of its construction – create an elegant and simple expression of celebration of water – which everyone seems to understand without much explanation. Once London was awarded the Games, the organizers instructed that they would be the most sustainable Olympics in history. Therefore, the central idea across all the new London 2012 Olympic venues was to design and construct venues for the long-term legacy after the Games. These new venues are then temporarily adapted for use during the Olympics. This is key to the sustainability of all Olympic development – and very important for London, as the city cannot afford to be left with many expensive, oversized and under-used venues. In Olympic mode the competition pools are absolutely unique in the world due to the temporary spectator terraces rising above the height of the ceiling over the swimming pools. This means that the spectators on one side cannot see the spectators on the other side. Instead, their view is focused on swimmers in the pool. Combined with the strong lighting which will highlight the pool water, it will also be a very dramatic and vibrant experience for the spectator. Outside the Olympics, by reducing the capacity from 17,500 to 2,500 seats, the volume of the building is also dramatically reduced – requiring much less energy to heat and maintain the Aquatics Centre in the future. Did the location in East London inspire you in any specific way? Unlike most European cities, there are still large gaps in London that allow for a major urban intervention on an interesting scale. Almost twenty years ago, I did a project that researched how London should be developed towards the east to create a new civic centre in the Lea Valley. It’s fascinating to see this becoming a reality with the Olympics as a catalyst for regeneration. The legacy that the 2012 Games will give the city is breath-taking. The new Olympic Park is one of the largest new public spaces in Europe and our design for the London Aquatics Centre very much considers its use by Londoners long after the Games. How did you familiarize yourself with the location before the design process and in what ways did you take the surrounding area into account in the actual design? Our architecture is extremely contextual. In all our work, we first investigate and research the landscape, topography and circulation of the site. Then, we draw certain lines of visual connections with the local environment and lines of circulation that become evident from these investigations. We use these lines and connections with the surroundings to inform the design. This “embeds” the design into its environment so each design has a very strong relationship with its unique context. Do you use specific architectural methods for bringing elements of beauty into functional spaces, or is it an intuitive process? Design & Architecture should be the complete marriage of form and function. One should never be sacrificed for the other. The environments we create are specific to, and embedded within, the function and topography of each building. We are always experimenting – how the building is going to be used—whether as a living space, or public or industrial space—is always foremost in our considerations. We never take a brief literally but instead try to interpret the purpose of an institution, as it is not only the form of a building that interests us – but we also research new and better ways in which people can use a building. My primary concern has always been with organization rather than expression. I think the most interesting part for me, from the early period till this day, is the organization which allows the making of a new diagram. That’s really the beginning of the project. This programming deals with how you respond to the program and to the site at the same time. There is a notion of design there. All the forces operate at the same time to come up with one thing. Do you ever use pre-existing spaces as models, or do you prefer to reference abstract forms rather than space? Form and programme cannot be separated from each other. We are always engaged in the question of how form relates to the programme. We build up a complexity of project in relationship to the inherent complexity of the programme or arrangement of the brief, but then we clarify the diagram as much as possible so it should be a legible configuration.With all of our projects, there is never an immediate attempt to create a particular form; there is always an underlying logic and architectural method within the design which we then push to the highest standards. If the completed design becomes a particular form, it is an expression of essence and quality of the project itself – and not because the design represents something else. We are not shy to develop a programmatic logic or formal logic to a point where the design is recognizable as our work, but that is not an immediate aim, it is something which evolves. When choosing building materials, in what ways does climate and geographic location dictate your choices? Yes, for example, we love using concrete in our buildings because it is so fluid and continuous – and achieving the highest standards on complex concrete structures is as much a feat of logistics as it is a design and construction challenge. Many factors must be taken into account to maximize results – even the temperate on the construction site must be considered. One of the drawbacks of concrete is that it is very heavy—so a whole section of our office is now working on projects that make use of alternative, lightweight materials that approximate that fluidity. We are always researching new and better materials and construction methods. I find that the concrete industry is very much capable and geared up to what we are doing. Do you think innovative architectural projects will continue changing the East End of London after the Olympics to the same extent as Barcelona was transformed following the 1992 Olympics? In the past, there were no projects for that part of the city and little attention was given to urban harmony. Nobody thought about it. But today things are looking much better. The legacy the 2012 Games will give this part of London is breath-taking. There has been a massive investment in transport infrastructure. Naturally, new housing, education, retail and office development has taken advantage of this improved infrastructure – and I expect it to continue. Can a city loose its personality and style if gentrification takes over too much? It’s a very thin line between saying to people that ‘everything must be preserved’ – and yet one also believes in the improvements that progress can bring. I don’t believe cities should be like Venice and not grow or change at all. It is important to intervene in a contemporary way – but you must do it in a very precise manner. In cities, you need places where things can shrink and expand – you need to allow and plan for an organic kind of growth to occur. There has been a move over recent years towards walled, private space. But for the past three hundred years, architects have been trying to, in different ways, liberate the city, to open it up, to make it more porous, more accessible – creating parks and public spaces that everybody use as their own. But making walled gated communities within the city, like many small fortress castles, is a major step backwards. It is a very archaic way of living. I think that there has to be a reaction to this. In every new project, it is critical to include civic spaces that engage with the city. These public spaces are a vital component of a rich urban life and cityscape.